It seems that no matter how many genetic mutations and disfigured freaks of humanity gamers dispose of, our appetite for apocalyptic action is apparently, insatiable. 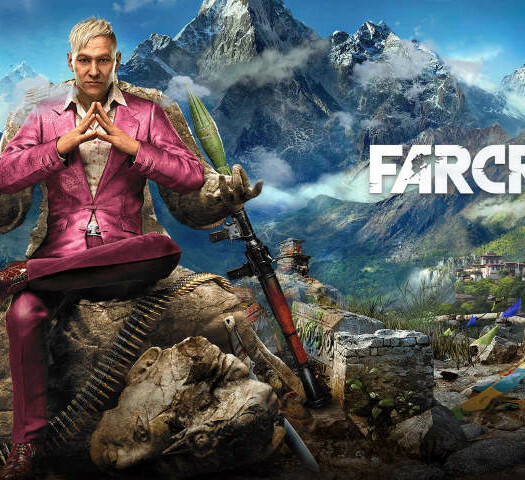 For developers, it’s become the new go-to fictitious scenario, only surpassed by the military shooter for the award of ‘most oversaturated subject matter of this generation’. Even Naughty Dog, a studio revered for its advances in cinematic storytelling and graphical splendour, has been bitten by the infectious bug with their latest title The Last of Us, determined to cleanse our palates for one more taste of the tired, worn-out setting that we’ve all been chomping through since this prolonged generation began. But are we fit to burst after gorging on so many doomsday games already, each one determined to define themselves as the definitive survival experience? Or can The Last of Us really succeed where others have failed and cook up a powerful, believable story, enriched with delectable gameplay using such sparse and familiar ingredients? The answer is yes. And sadly, no. 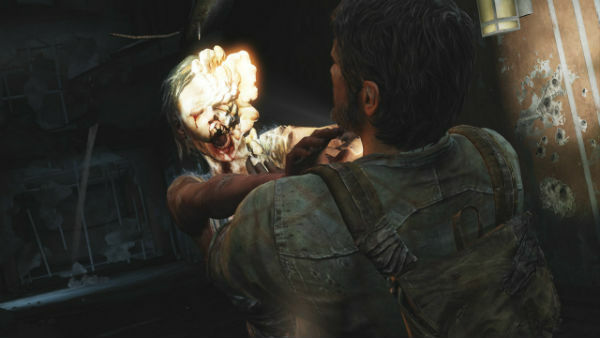 Though The Last of Us’ story centres around a commonly explored theme with interchangeable parts – in this case, a fungal outbreak spreads throughout America, forcing humanity to the brink of its very existence and scrambling back into the dark ages – the execution and believability of this particular nightmare has never been portrayed so poignantly in a video game. With the world transformed into an unforgiving dystopia, it’s survival of the fittest, and in many ways… the sickest. Humans slaughter other humans; factions fight stubbornly for their beliefs; food and supplies are fiercely rationed, while the government desperately tries to maintain some sort of order and normality in a world that is now strange and disturbingly foreign. But remarkably, humanity adapts. People endure; empowered by the one emotion that every religion, faith and person calls upon during times of hardship. Hope. It’s a cruel world out there. 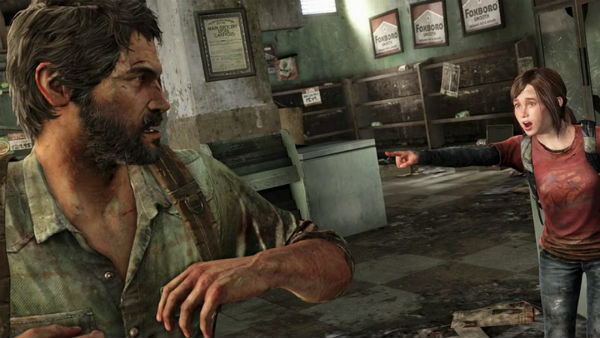 And hope is exactly what keeps The Last of Us’ main protagonist, Joel, alive. Every day is a constant struggle since the outbreak, forcing Joel to murder, steal and find any sort of solace he can in this cruel, twisted, brave new world. While children are now born into the horrors of this ravaged society, Joel knew what life was like before the pandemic – he’s presented with a daily, taunting reminder of a better time. For that reason alone, he’s a naturally guarded individual who can come across as cold and uncaring, not to mention the fact that it’s difficult to empathise with a man who can choke another human being to death without batting an eyelid. But Joel’s character slowly develops into a figure of bravery, devotion and strength. And it’s a young girl named Ellie who acts as the catalyst for Joel’s gradual transition. Ellie knows no other world than the hell she’s grown up in, and her naivety and inquisitive child-like nature acts a successful go between for the two characters to interact. And, even though Ellie is naturally afraid, less adept at dealing with the atrocities of the present day, she’s got a ballsy attitude and the confidence of youth on her side, elevating her from a helpless hindrance into a gutsy, albeit fragile, young woman. Brought together by mere chance and circumstance, Joel and Ellie set out on a perilous quest to find the renegade group known as The Fireflies. Though Joel’s reluctant to be burdened with a girl who may pose a threat to his own survival, Joel and Ellie prove to be a fitting partnership, forging a truly captivating and meaningful on-screen relationship throughout the game. The Last of Us is a considerably slower-paced game in comparison to the action-packed outings we’re used to from the apocalypse inspired genre; and admittedly, it takes quite some time to fully appreciate. You won’t find the daredevil antics of a certain adventurer here, instead, you’re asked to soak up the atmosphere, explore the area for various supplies, and lose yourself in the narrative that plays out between the characters. And, while The Last of Us’ laid back approach is certainly admirable, it’s difficult to escape the sense that you’re often just travelling from point A to point B with little to do. It’s during these points that the gameplay, or lack of any, feels like an afterthought, enlisted only to service the riveting story. After a while an ugly pattern emerges. Whenever Joel and Ellie encounter an obstacle that doesn’t involve overcoming enemies, the rudimentary solution to solving it is, at times, laughable. The fact that some of these solutions are repeated to the point of exhaustion does little to help matter. You’ll quickly grow tired of repositioning conveniently placed ladders and planks, moving dumpsters that luckily have wheels, finding wooden palettes, and boosting partner, after partner, up and over numerous walls. In all honesty, it verges on the point of ridiculous after a while and actually serves to break the immersion that Naughty Dog were clearly after. Of course, some will look past this as a minor gripe, but after jumping through crumbling buildings and scaling impressive monuments with Nathan Drake, it’s difficult to understand as to why Naughty Dog couldn’t do better than the formula of find generic object, move generic object, give someone a boost up. It doesn’t even feel remotely believable towards the end of the game. Joel decided to put his foot down. Luckily, things improve when enemies are brought into the fray, with a pleasant contrast of fighting (or avoiding in most cases) groups of infected humans and dangerous, uninfected gangs. Infected humans come in three flavours: Clickers, Runners and Bloaters, while the gangs carry your usual selection of weapons and pointy objects. Clickers will bear the brunt of your colourful vocabulary as they represent one of two enemies that can deliver a one-hit, instant kill. Clickers will bear the brunt of your colourful vocabulary as they represent one of two enemies that can deliver a one-hit, instant kill. Luckily, to balance this out somewhat, Clickers are blind: they can’t see you, they can only hear you. You are therefore required to crouch and slowly sneak past them whenever you can, and it’s wise to do so because when a Clicker comes rushing, you need to have a perfect aim and plenty of bullets in the chamber to avoid death. The ferociousness of the Clickers does create a satisfying, tangible tension, but it really isn’t fun when one false move leads to your inevitable death. Also, your AI partners freely run around haplessly and loudly, thicker than the wooden planks you’re so used to moving around. And although it would be annoying if your AI partners set off the Clickers with their ineptness, it does seem rather silly that Joel is the only one trying to keep quiet. Runners, on the other hand, are far weaker and more in keeping with the zombie stereotypes we’ve come to expect. The key difference, however, is their sense of speed and that they can see. They won’t stumble and bumble towards your location; they’re surprisingly quick, nimble and effective at alerting nearby Clickers to your whereabouts. Take them down silently or quickly face the consequences. Combat can be approached in a variety of ways, though you typically fall back on what works and what doesn’t. Going in all guns blazing generally does not, specifically because you never have the ammunition to do it. Stealth, on the other hand, does, however it can often be a needlessly frustrating source of anguish. When Joel crouches behind objects, he doesn’t automatically stick to them like in the majority of cover games. It’s a change for the better in all honesty, a design decision which prevents Joel from coming across as a highly-trained super soldier, but one that can lead to a few accidental sightings and worse, your immediate death. For the first few hours, it’s hard to shake the impression that The Last of Us’ stealth sections rival the awkward ones found in Uncharted – an unflattering comparison if there ever was one – however, once you understand that sound is your trusty guide, things become a lot smoother. Turn up the volume on your TV, because The Last of Us employs many audio cues to heighten the atmosphere and most importantly, aid gameplay. If you walk into an enemy’s line of sight, a swelling noise will begin to rise. Should you manage to duck back behind cover, the noise will fade. It’s similar to that of Hitman Absolution’s detection meter, but far less punishing. Once you’ve avoided the glare of the enemies, you’re then tasked with listening to their movements, an alternative take on Batman’s detective mode, which reveals the whereabouts of your foes. From here, it’s a strategic decision as to how you proceed. Do you pick up a nearby brick or bottle and create a distraction? Stalk your enemy into a secluded spot and choke them to death? Or whip out your gun and aim for the headshots? There’s plenty of scope to the combat, and it’s vital that everything you do is done as efficiently and as silently as possible. The fluidity of melee encounters is particularly spectacular, but that being said, it’s easy to just mindless mash square until your enemy succumbs to a bloody, cinematic death. You can’t help but wish Naughty Dog did a more with the combat with The Last of Us because too many mechanics seem shallow once you’ve figured them out. The use of items like pipes and machetes can improve your chances and strength in melee confrontations, though the bricks and bottles that are strewn around the levels become surplus to requirements eventually. Also, another negative from a gameplay perspective arises when it comes to the gunplay. It simply isn’t as tight as it could have been. In fact, I had to turn up the sensitivity to the maximum level to stand any chance of connecting with my shots, as the aiming was far too heavy and rigid on the default setting. Hit detection also feels suspect; when your ammo is limited, it’s devastating to see your shots skim by from no fault of your own. Scavenging is a natural part of surviving, and The Last of Us instills this very notion early on. Due to the larger, less linear environments, it’s important to search for any equipment you can as you’ll be fashioning all sorts of crude tools. First aid kits, molotov cocktails, shivs and nail bombs, Joel can whip off his backpack and craft numerous items that will help you survive. Upgrading weapons is also a possibility, with work benches appearing periodically throughout the game allowing you to amplify your firepower. 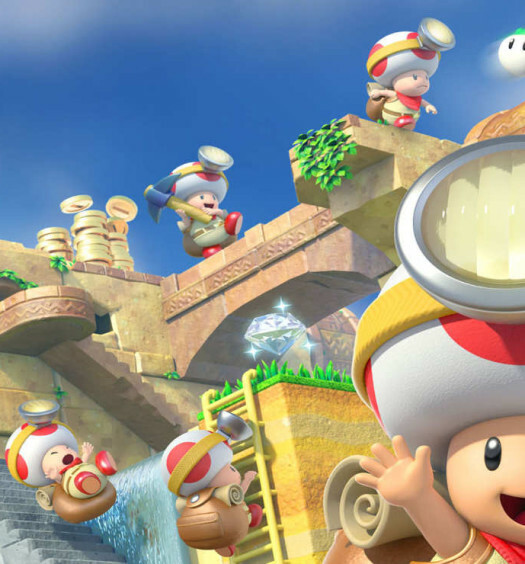 The game’s story can also be expanded by searching for various notes, letters and items that can be read. Pleasingly, Joel and Ellie will sometimes chip in with their thoughts on what they find, adding to the already engaging storyline. To sweeten the deal, The Last of Us features a surprisingly solid multiplayer mode that provides plenty of twists to the single player foundations. Much of the same mechanics are present here, but there’s a definite feeling of freedom and experimentation due to the fact you know that one wrong move doesn’t equal near instant death. The Last of Us features a surprisingly solid multiplayer mode that provides plenty of twists to the single player foundations. You can choose between Firefly and Hunter factions, and your aim is to survive 12 weeks. Each match plays out like one day, and each week you’ll be given an objective to complete. Depending on how many people you kill and items you find, you’ll gain survivors instead of plain old experience points and ranks. You’re then responsible for continuing to succeed in battles, which are team-based deathmatches, to gain more survivors and keep them healthy. It’s a refreshing take on a stale formula and definitely isn’t just a tacked on mode. As we’ve come to expect from Naughty Dog, The Last of Us is a tour de force in graphical design. Whether it’s the characters’ fluid animations, the sinister death scenes, or the strained facial expressions of Joel when pinned under fire, Naughty Dog manages to squeeze out the best of the PlayStation 3 hardware. The lighting when entering dark areas is particularly incredible, as Joel’s torch light bounces off walls and objects with uncanny realism; as too is the the effect of diving underwater which has never been captured so expertly. Technically, though, the game does have its flaws. I encountered numerous bugs during my playthrough. Joel disappeared entirely from the screen, the audio cut out during cutscenes and the dreaded auto-save bug, which has now thankfully been squashed, was alive and well during my time with the game. It should also be noted that The Last of Us takes a considerable time to load when starting up. It may only be an initial load, but it puts Uncharted’s continuous spinning, level-loading coin to shame. From a consumer standpoint, it’s disappointing to see so many issues that could only be forgiven if The Last of Us was an open-world game, and of course, it isn’t. On a final note, it would be wrong to gloss over the fact that The Last of Us can’t escape the shadows of negative connotations that engulf the game’s mature direction. 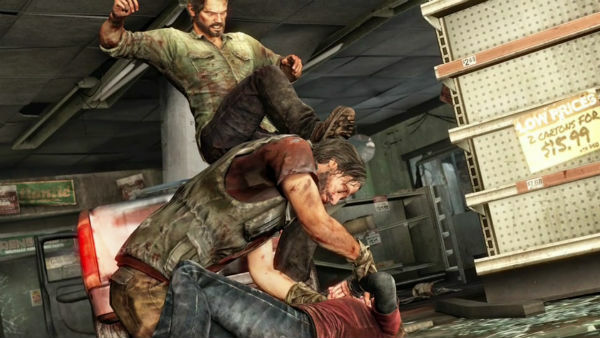 Outsiders will continue to tar every video game with the same brush and The Last of Us provides ample fuel for their fire that video games are nothing more than over-the-top displays of vulgar violence, filled with coarse language. 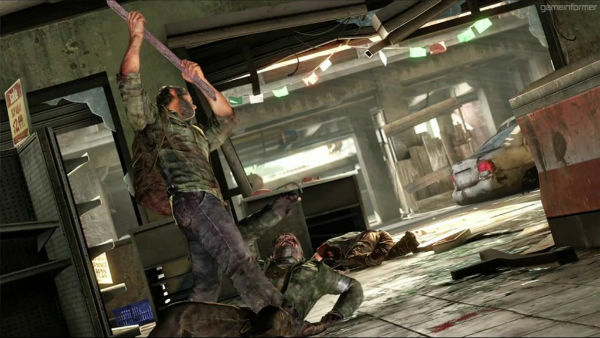 Whether Joel’s having his eye sockets pulled apart by a Bloater, smashing an enemy’s face into a bloody pulp with a brick, or Ellie’s tendency to drop the ‘F word’ into almost every sentence – The Last of Us’ mature story is disappointingly jaded by too many unnecessary, common gaming stereotypes. A review copy of The Last of Us was provided courtesy of Sony Computer Entertainment Europe. Unfortunately, The Last of Us fails to continue Naughty Dog’s stunning streak of self-imposed excellence. It’s still a highly commendable title, one that delivers an accomplished experience that steps ever closer to matching Hollywood’s finest exploits with a turbulent and evocative storyline fit for the silver screen. But disappointingly, the game is significantly hampered by the burden of besting its unimaginative inspiration, and the rude occurrence of too many safe and predictable gameplay mechanics often leave you with the impression that your interaction is nothing more than a vehicle to trigger yet another finely tuned cutscene. A great game, then, but one that regretfully uses gameplay as a garnish instead of the main course.